Lately you have seen post from me on the topic of Brand Advocacy; it happens that I have a vantage point as I have the privilege of access to the data for all the Advocacy Programs Zuberance runs every day... I wish I could simply share this with you every day, alas I can't as it is privileged information owned by our customers. Recently Restaurant.Com kindly share a few snippets of this data with attendees to the WOMM-U 2012, here for your enjoyment! 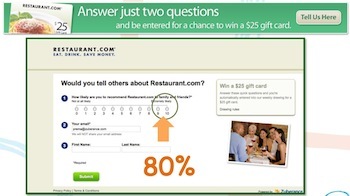 How has Advocacy moved the needle for Restaurant.Com? It is not about "IF" Brand Advocacy works; it is a question of taking the steps to make it work for you.